Lawmakers and Gov. Roy Cooper’s staff are negotiating the structure of a new state agency to replace the Bipartisan State Board of Elections and Ethics Enforcement. For now, though, it’s unclear how elections enforcement will be handled after Monday, Dec. 3. That’s when the current board presumably must dissolve, based on a court order handed down last month. 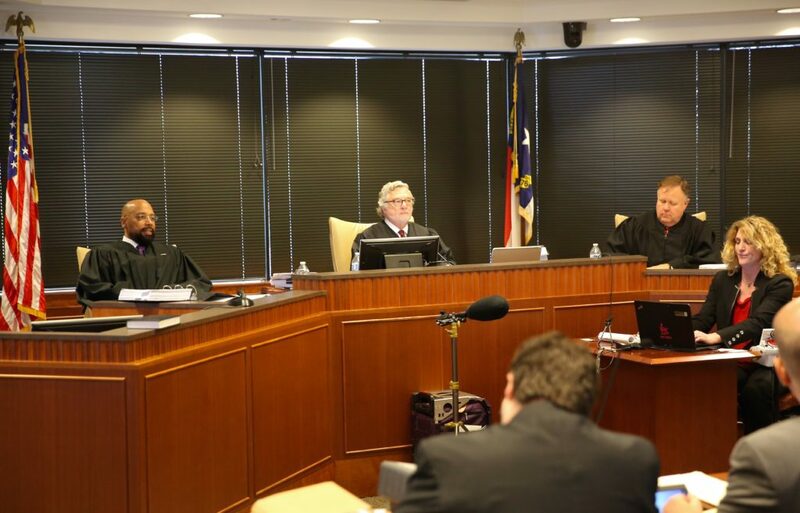 The elections board’s makeup has been the subject of constitutional battles in the courts for two years as the Republican-led General Assembly first attempted to trim the governor’s appointment powers in the waning days of the 2016 legislative session. Courts have rejected three legislative attempts to alter the makeup of the elections board, saying they encroached on the constitutional authority of the executive branch. A referendum on the Nov. 6 ballot seeking to enshrine elections board changes in the state constitution failed. Because the amendment failed, separate Superior Court rulings from Oct. 16 and Oct. 22 hold sway. The first ruling declared the current board unconstitutional. But to prevent disrupting the election, the second ruling kept the board in place until Dec. 3, the date by which elections were supposed to be certified. The Oct. 22 Superior Court order stating the current elections board must dissolve when the Nov. 6 results are certified. And yet the elections board has not certified the results of the Mark Harris-Dan McCready race in the 9th U.S. Congressional District. So it isn’t clear how that might affect the judges’ order. An advisory letter Nov. 28 from N.C. Chief Deputy Attorney Alexander McC. Peters to Cooper’s general counsel William McKinney concludes the board’s framework would revert to what was in place before the General Assembly altered it the first time. “There are certainly arguments that are different from that opinion that could be made. It’s something that we’re trying to work through right now to be perfectly frank,” Pat Ryan, a spokesman for Senate leader Phil Berger, R-Rockingham, told Carolina Journal Nov. 29. “Negotiations have been going on all this week, and will be continuing through the weekend” in hopes of reaching a compromise before Monday, Ryan said. Berger and House Speaker Tim Moore, R-Cleveland, discussed the situation with Cooper Monday over breakfast, and discussions among legislative and executive staff began immediately afterwards. “We have some ideas that we hope can get support on the House side and the executive branch, and we’re continuing with those conversations. There’s not a whole lot to be able to report right now because those negotiations are still ongoing,” he said. Ryan acknowledged there is a fiery history on the elections board subject. “We’re trying to reach a non-adversarial outcome” before Monday’s deadline, he said. Should that not be possible, contingency plans are being examined. Requests for comment from Moore weren’t answered. While the DOJ makes it clear what the structure of the board must be if it’s not replaced by legislation, it’s unsure which elections board members and staff would get their walking papers. The board currently has nine members, but would have only five under the changes. Executive Director Kim Strach, whose appointment was part of the unlawful changes, presumably would lose her position. Cooper wants all questions about the elections board situation to go through him. Requests for comment from his office weren’t acknowledged. “I think that’s something of an open question,” Ryan said about how to revert to the original board structure. Legislative Republicans earlier said they set up a bipartisan board to prevent the governor from having too much partisan influence over a body which isn’t legally under his control. Peters’ advisory letter to the governor says there is a well established principle that an unconstitutional law is void, and once that determination is made the prior law once again becomes effective. If so, the elections board would return to a five-member body appointed by the governor. Members would come from two lists of five people nominated by state political party chairmen. No more than three members from one party could be on the board at once. Governors routinely chose a majority of members from their own party. The elections board no longer would handle ethics complaints, which again would be the domain of a separate state agency. The ethics agency also would have to be recreated. County elections boards also presumably would revert to their earlier form, with three members instead of four. Two of the three members typically were from the governor’s party. Currently the elections board is a nine-member body appointed by the governor. State political party chairmen provide him with a list of six names from which to choose eight members. The ninth member is unaffiliated politically, and chosen by the other eight members.